Bring a chair, blanket and your appetite for great music! 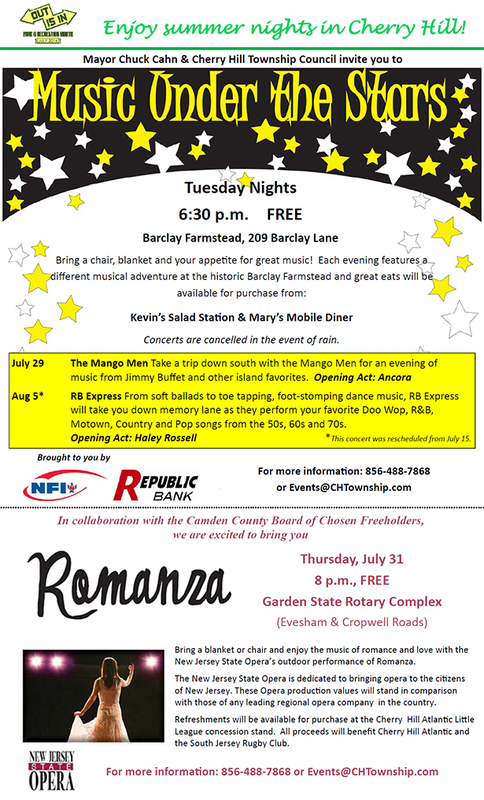 Take a trip down south with the Mango Men for an evening of music from Jimmy Buffet and other island favorites. From soft ballads to toe tapping, foot-stomping dance music, RB Express will take you down memory lane as they perform your favorite Doo Wop, R&B, Motown, Country and Pop songs from the 50s, 60s and 70s. Bring a blanket or chair and enjoy the music of romance and love with the New Jersey State Opera's outdoor performance of Romanza. The New Jersey State Opera is dedicated to bringing opera to the citizens of New Jersey. These Opera production values will stand in comparison with those of any leading regional opera company in the country. Refreshments will be available for purchase at the Cherry Hill Atlantic Little League concession stand. All proceeds will benefit Cherry Hill Atlantic and the South Jersey Rugby club.